Persoon, C.H. 1805. 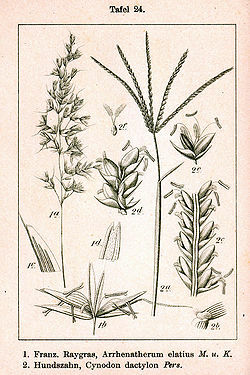 Synopsis plantarum, seu enchiridium botanicum, complectens enumerationem systematicam specierum hucusque cognitarum. Pars prima. XII+546 pp. Apud Carol. Frid. Cramerum, Parisiis Lutetiorum [Paris]; Apud J. G. Cottam, Tubingae [Tübingen]. BHL Biblioteca Digital Reference page. : 85. Govaerts, R. et al. 2015. Cynodon dactylon in World Checklist of Selected Plant Families. The Board of Trustees of the Royal Botanic Gardens, Kew. Published on the internet. Accessed: 2015 Apr. 28.
International Plant Names Index. 2015. Cynodon dactylon. Published online. Accessed Apr. 28 2015. Tropicos.org 2015. Cynodon dactylon . Missouri Botanical Garden. Published on the internet. Accessed: 2015 Apr. 28. USDA, ARS, Germplasm Resources Information Network. Cynodon dactylon in the Germplasm Resources Information Network (GRIN), U.S. Department of Agriculture Agricultural Research Service. Accessed on 07-Oct-06. For more multimedia, look at Cynodon dactylon on Wikimedia Commons. This page was last edited on 1 April 2019, at 11:48.